Periodontally accelerated osteogenic orthodontics (PAOO) is a clinical procedure using a combination of alveolar corticotomy, particulate bone grafting followed by the application of orthodontic forces. This procedure is based on a phenomenon known as regional acceleratory phenomenon. The advantages of PAOO include increased width of alveolar bone, shortened treatment time, increased postoperative stability, and decreased chances of root resorption. PAOO leads to a transient stage of osteopenia which helps in faster tooth movement. A more stable periodontium is provided by this technique due to the augmented bone volume. Furthermore, there is decreased need for extractions and an increased bony support for teeth and overlying soft tissues, thereby improving the gingival and facial esthetics. 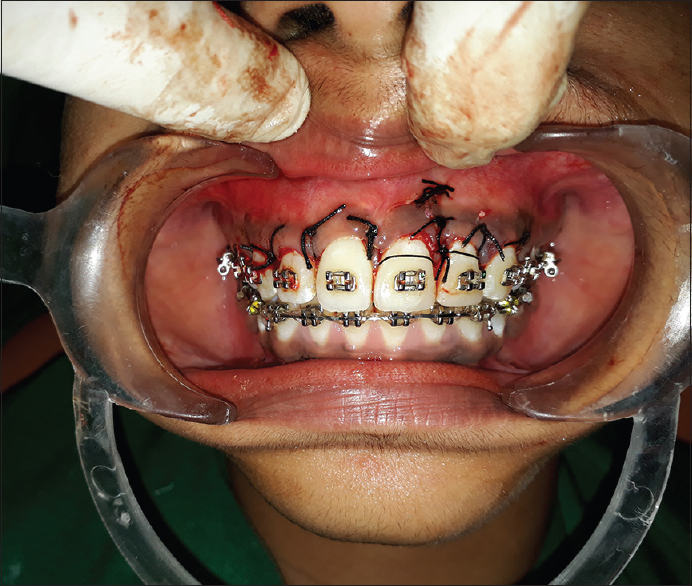 This case report describes a surgical technique involving corticotomy-assisted orthodontic treatment. Since the past few years, an increasing trend has been observed in the number of adult population seeking orthodontic treatment. 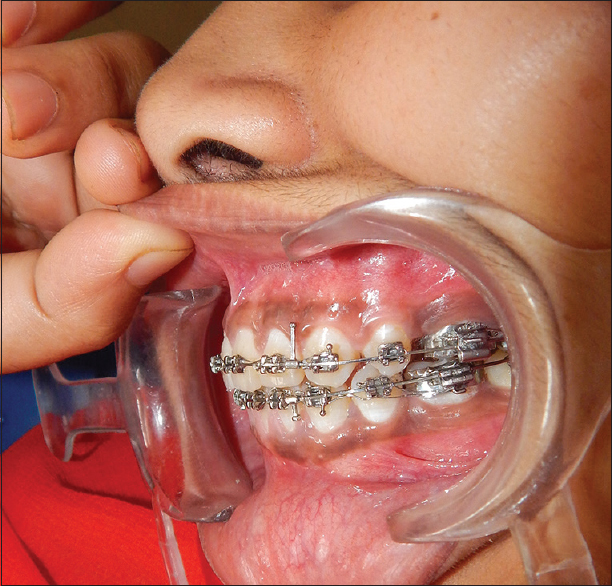 Various differences have been noted between the orthodontic treatment of adults and adolescents. Adults have highly specific concerns and goals with regard to esthetics. The type of appliances as well as the duration of treatment also varies in adults. Unlike children, growth is almost insignificant in adults, and hence, there is an increased chance of hyalinization during adult treatment. When tooth movement is imitated in adults, mobilization of cells as well as conversion of collagen fibers is much slower. Furthermore, adult patients are highly prone to periodontal complications because the alveolar bone is nonflexible. Due to the abovementioned conditions, adults need special care and procedures while performing orthodontic treatment. These procedures might include use of shorter periods of treatment, the use of lighter forces, and more precise tooth movements. This challenging tooth movement in adults leads to the development of a concept called corticotomy-assisted orthodontic treatment. The use of corticotomy was first demonstrated by Kole in 1959 to treat malocclusion. 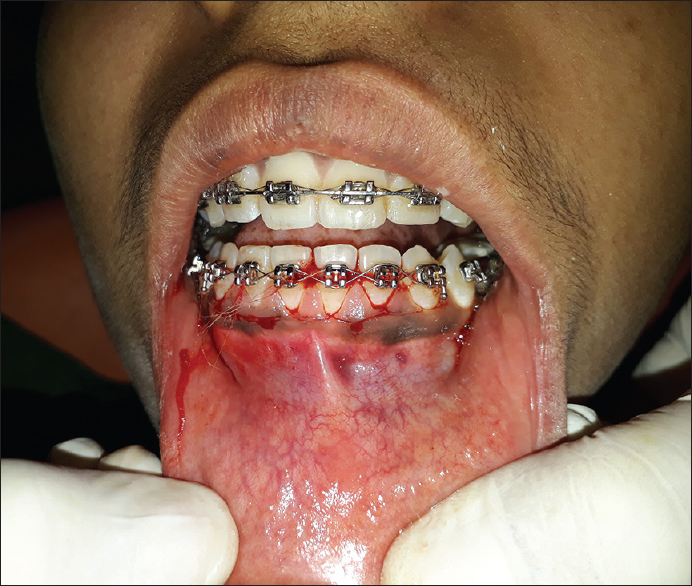 The indications for corticotomy include bimaxillary protrusion, moderate to severe crowding, Class II malocclusions requiring expansion or extractions, and mild Class III malocclusion. 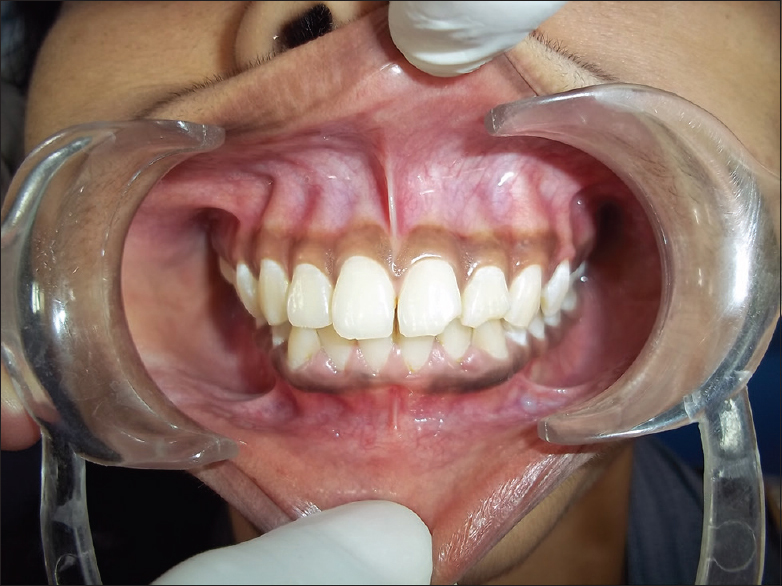 The case report discussed below describes the technique of periodontally accelerated osteogenic orthodontics (PAOO) technique. This technique developed by Wilcko et al. is a combination of selective decortication of the alveolar bone followed by alveolar augmentation. This leads to reduced treatment time, enhanced expansion, differential tooth movement, and more postorthodontic stability. Teeth can be moved 2–3 times further in one-third to one-fourth the time required for traditional orthodontic therapy. A 19-year-old female patient reported to the dental college with a chief complaint of forwardly placed upper front teeth for 3 years. 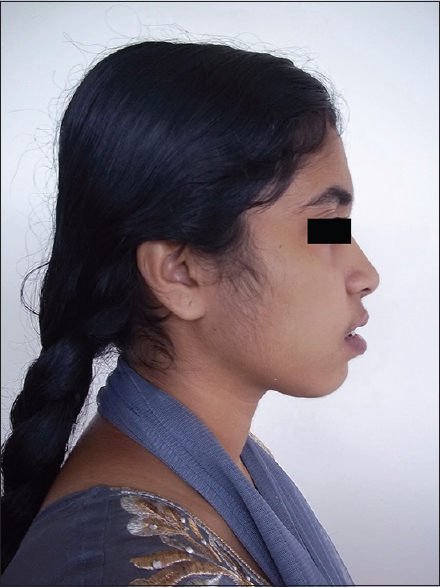 After thorough clinical examination, a diagnosis of Angle's Class 1 malocclusion with bimaxillary protrusion and upper anterior spacing was made [Figure 1], [Figure 2], [Figure 3]. 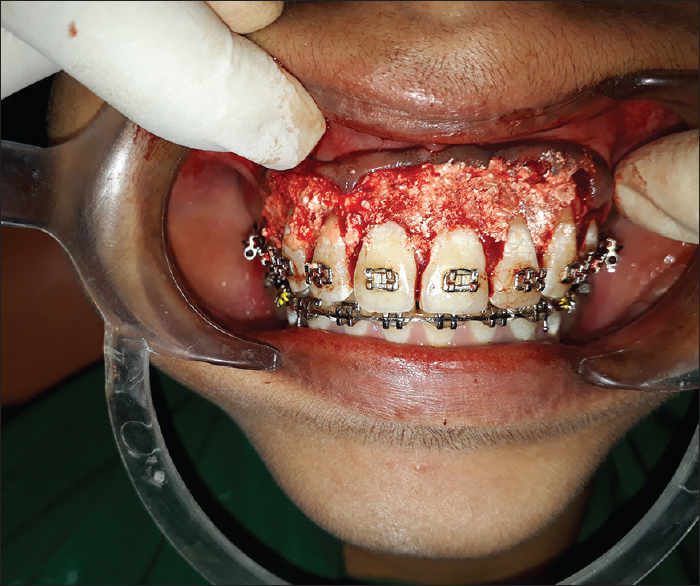 Treatment plan included extraction of all the 4 s premolars, followed by retraction, corticotomy, and bone grafting in the upper and lower anterior region [Figure 4] and [Figure 5]. A periodontally accelerated osteogenic orthodontic surgery was planned, and patient's consent was taken regarding the same. The patient was systemically healthy and had a sound periodontal health. Before the PAOO surgery, phase 1 therapy including scaling and root planning was also performed. All the surgical procedures were performed under local anesthesia. Corticotomy was first performed in the maxillary anterior followed by mandibular anteriors. For the maxillary anteriors, a sulcular incision was given followed by vertical releasing incisions at distal line angles of the left and right canine. 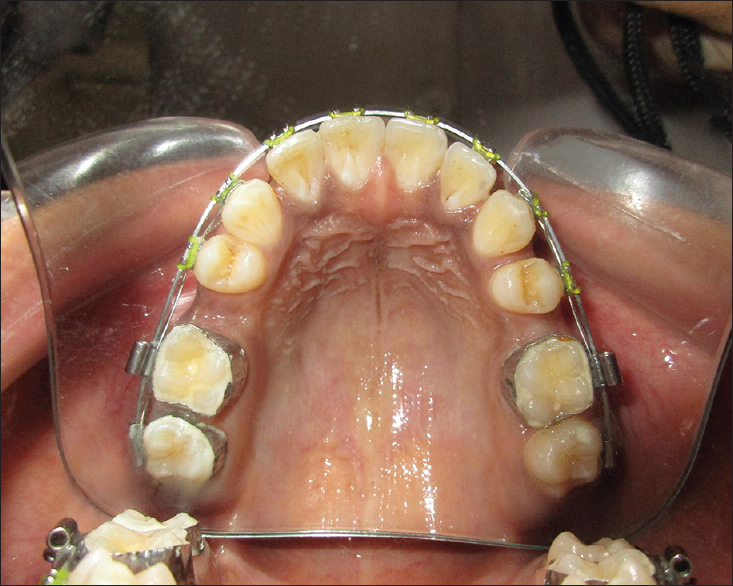 A full-thickness mucoperiosteal flap was then elevated beyond the apices of the teeth. Vertical cuts were made through the buccal cortical bone with a round bur along with saline irrigation. The vertical cuts started 1.5 mm below the interdental crest and were deepened to about 2 mm to extend into the spongiosa. A bioresorbable bone graft (demineralized free-dried bone allograft) was placed along with a collagen membrane, and the flap was approximated with interrupted sutures. Analgesics and antibiotics were prescribed to the patient for 5 days following the surgery. The patient was reviewed after a week and the healing observed was satisfactory. The patient experienced mild swelling and pain during the healing period. The active orthodontic treatment began 1 week after the surgery [Figure 6], [Figure 7], [Figure 8], [Figure 9], [Figure 10]. 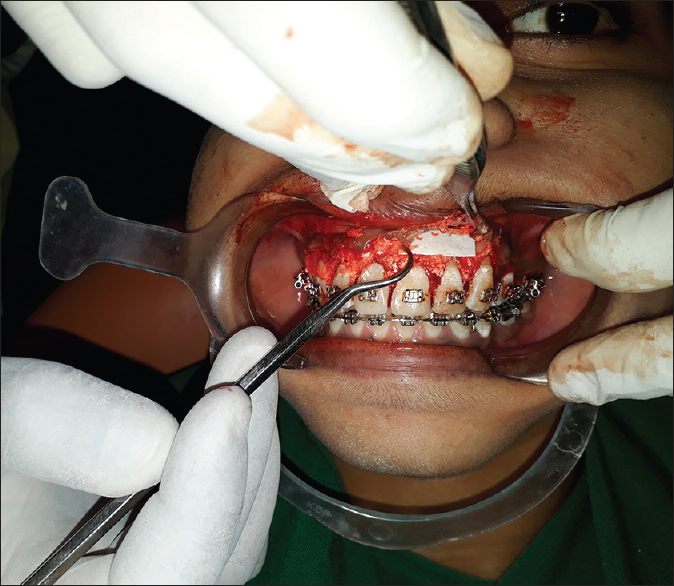 After a period of 1 week, a modified corticotomy procedure was performed for the lower anteriors where a mucoperiosteal flap was raised preserving the gingival margin. This preservation of the soft tissue helps to minimize recession and ensures to a good esthetic architecture of interdental papilla postsurgery. The other surgical steps were the same as the maxillary anteriors [Figure 11], [Figure 12], [Figure 13], [Figure 14]. One of the most important goals while treating malocclusions in adults is the reduction of the treatment time. In corticotomy-facilitated orthodontics, the reduction of orthodontic treatment time by approximately 50% was observed. In the above case report, a treatment time of around 3 months was taken for retraction of the upper and lower anteriors following corticotomy [Figure 15] and [Figure 16]. With conventional orthodontic treatment, the treatment time for the above case would have extended to 6 months. PAOO technique involves the surgical scarring of cortical bone of the teeth to be moved orthodontically, followed by grafting. This surgical scarring leads to a state of localized osteoporosis as a part of a healing event called regional acceleratory phenomenon (RAP) which may be responsible for the rapid tooth movement after PAOO. RAP generally occurs after fracture, osteotomy, or bone-grafting procedure and may lead to recruitment of precursor cells which may be important for wound healing at the site of injury. The two main events noticed during RAP are decreased regional bone density and increased bone turnover. The RAP usually begins within a few days of injury and peaks at 1–2 months. This phenomenon lasts for about 4 months in bone. The RAP continues until there is active tooth movement. Once orthodontic tooth movement is completed, alveolar remineralization occurs. PAOO technique involves the use of bone grafts which help to increase the posttreatment alveolar volume. This helps in repairing any preexisting alveolar dehiscence over root prominences. In this case report, dehiscence was observed in the labial cortical plate of lower as well as upper canine due to excessive proclination of the teeth. Hence, bone grafting in such cases helps in reducing the likelihood of dehiscence which might occur after retraction of the teeth. The reduced treatment time due to corticotomy-assisted orthodontics is extremely beneficial to the patient's periodontal health because less time in fixed appliances reduces the time available for commensal bacterial biofilms to convert into pathogenic microbes and cause periodontal destruction. This is often seen in patients who wear fixed appliances for more than 2 years. Hence, this interdisciplinary approach of corticotomy-assisted orthodontics gives a dual benefit of faster treatment as well as reduced chances of periodontal destruction. Mathews DP, Kokich VG. Managing treatment for the orthodontic patient with periodontal problems. Semin Orthod 1997;3:21-38. Gantes B, Rathbun E, Anholm M. Effects on the periodontium following corticotomy-facilitated orthodontics. Case reports. J Periodontol 1990;61:234-8. Hassan AH, Al-Fraidi AA, Al-Saeed SH. 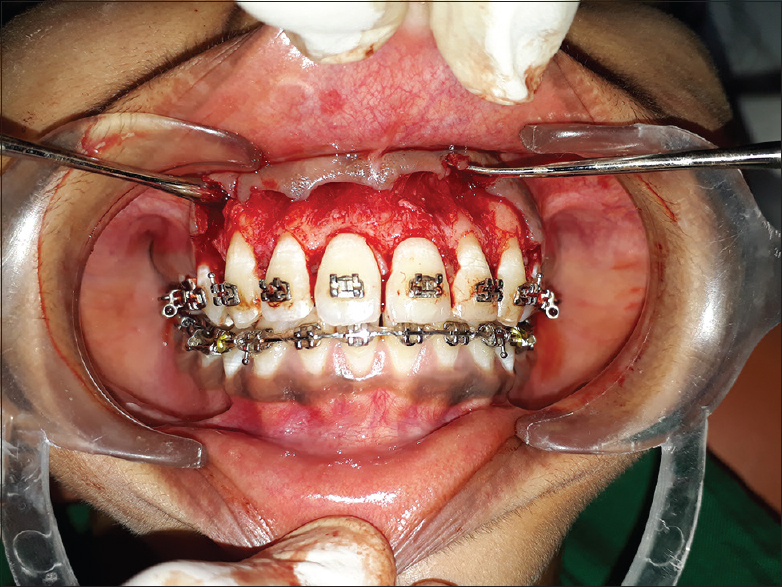 Corticotomy-assisted orthodontic treatment: Review. Open Dent J 2010;4:159-64. Wilcko WM, Wilcko T, Bouquot JE, Ferguson DJ. 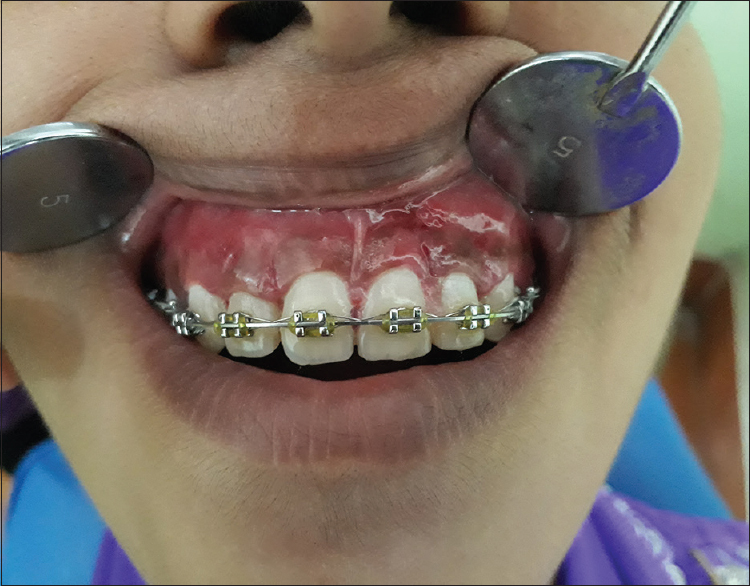 Rapid orthodontics with alveolar reshaping: Two case reports of decrowding. Int J Periodontics Restorative Dent 2001;21:9-19. Wilcko WM, Ferguson DJ, Bouquot JE, Wilcko MT. 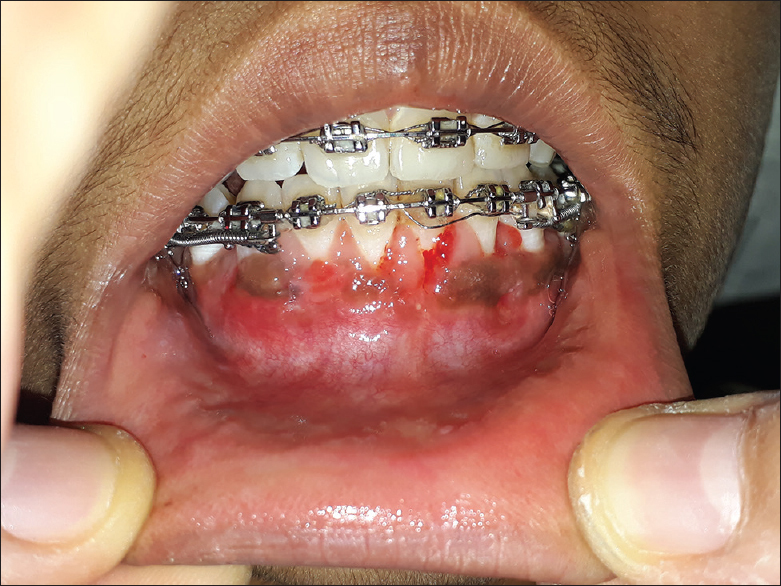 Rapid orthodontic decrowding with alveolar augmentation: Case report. World J Orthod 2003;4:197-205. Ren A, Lv T, Kang N, Zhao B, Chen Y, Bai D, et al. Rapid orthodontic tooth movement aided by alveolar surgery in beagles. Am J Orthod Dentofacial Orthop 2007;131:160.e1-10. Frost H. Regional acceleratory phenomenon. Clin Orthop Relat Res 1989;248:283. Wilcko MT, Wilcko WM, Pulver JJ, Bissada NF, Bouquot JE. Accelerated osteogenic orthodontics technique: A 1-stage surgically facilitated rapid orthodontic technique with alveolar augmentation. J Oral Maxillofac Surg 2009;67:2149-59. Soni JS, Nawathe AP, Brahmkshatriya HR, Jha LB. 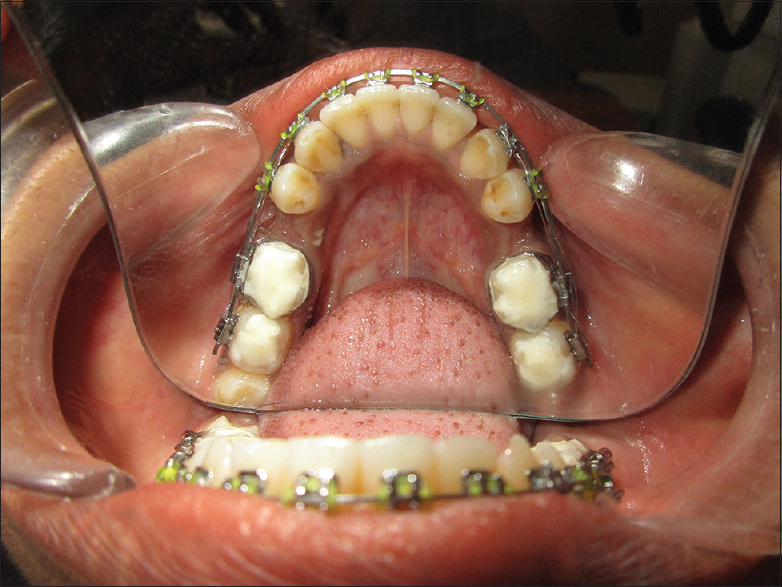 Alveolar corticotomies in orthodontic tooth movement: Review literature and case report. Int J Adv Health Sci 2015;1:12-5. Ong MM, Wang HL. Periodontic and orthodontic treatment in adults. Am J Orthod Dentofacial Orthop 2002;122:420-8.